SUMMONING (No Words) is an interactive sound temple built of the female voice. Theatrical and immersive, the installation recalls the origins of artistic practice in ritual, temple, ceremony and community. As audience members move through the space, their bodies activate the sound and the voices emerge, overlap, build, crescendo and recede. The experience changes with every physical interaction. Listen to an example of the live interaction here. For SUMMONING (No Words) seven female composer / vocalists each created an original vocal piece within compositional parameters set out by the project's composer consultant. Some of the pieces reference specific traditions or cultures, while others express contemporary and experimental forms. This soundscape is layered on top of a bed of whispered audio which includes poems, invocations, prayers and stories contributed by members of the community. The temple walls are created from ninety individual fabric panels created by the artists and community members using ancient Shibori indigo dyeing techniques. The resulting designs evoke images of sound waves. 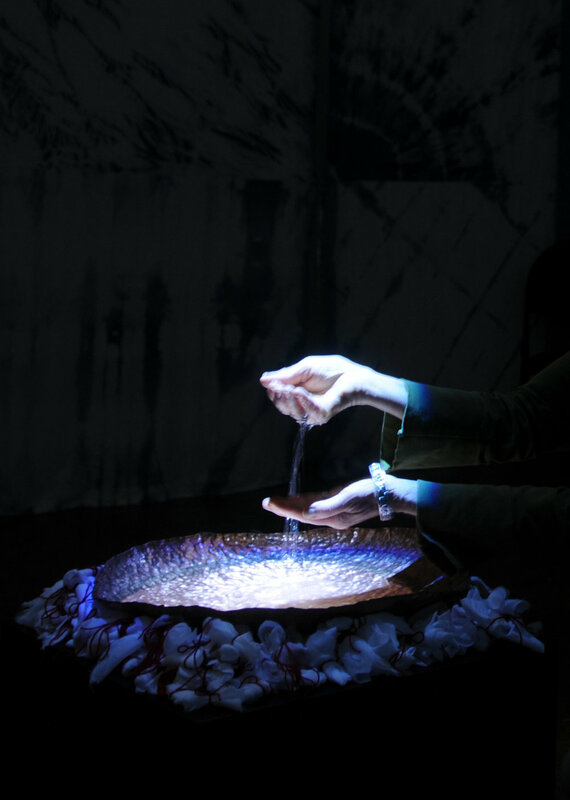 As part of the participatory nature of the work, audience members are invited to create a small ritual bundle to place around the central cauldron as an evocation of healing, remembrance and love. The premiere exhibition saw over 650 people come through to experience the temple.